Vitamin C and retinol are the ultimate anti-ageing ingredients for brighter-looking skin with reduced fine lines and wrinkles. Our Power Couple is getting a new look! Not all products within this Power Couple will be repackaged at the same time. It is possible that you may receive products with the old and new packaging in your order. This powerful anti-ageing duo combines superstar ingredients Vitamin C and retinol to address multiple signs of ageing. A concentrated dose of Vitamin C brightens dull skin while pure retinol reduces fine lines and wrinkles, improves firmness and refines the skin's texture for a radiant, rejuvenated-looking appearance. 1. 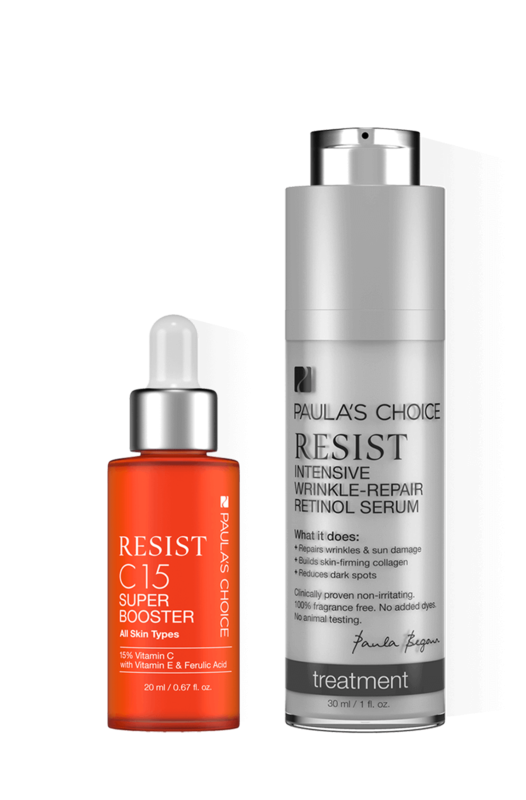 Apply the C15 Super Booster in the morning after cleansing, toning and exfoliating (do not mix with SPF) and use the Retinol Serum in the evening after cleansing, toning and exfoliating. 2. Or, alternate in the evening: one night mix the C15 Booster with your nighttime moisturiser and the following night use the Retinol Serum after cleansing, toning and exfoliating. Why do you recommend using the C15 Super Booster within three months? C15 Super Booster contains a high concentration of vitamin C, which loses its potency when exposed to light and air. Using it within 3 months guarantees its effectiveness, after this period the product may not be as potent. Unopened, the shelf life of C15 Super Booster is up to one year. 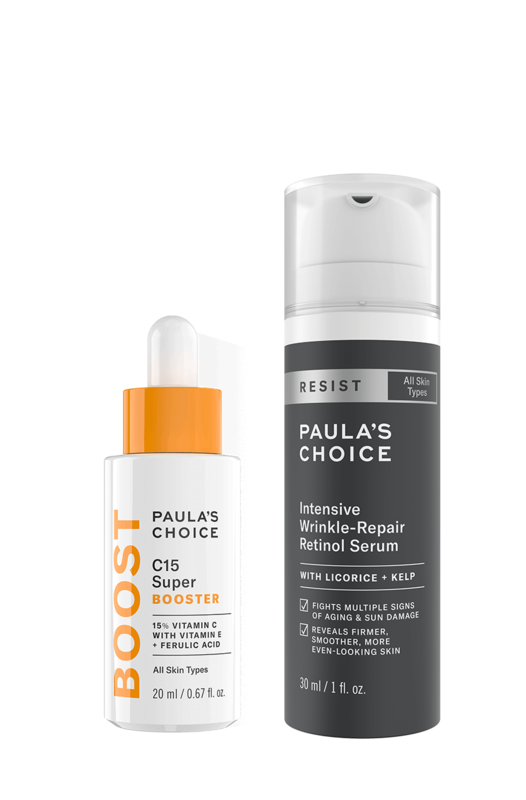 Can I use Resist Intensive Wrinkle-Repair Retinol Serum with my prescription retinoid product? Yes, you can use Resist Intensive Wrinkle-Repair Retinol Serum with a prescription retinoid but you may not need to. You may be fine just using one of the two products, or you can apply the prescription retinoid at night and the retinol product during the day. Either way, be sure to protect your skin with sun protection rated SPF 30 or greater during the day. Keep in mind that using multiple retinoid products increases the risk of irritation, so more is not automatically better! Can I use Resist Anti-Aging Wrinkle Repair Serum during pregnancy or breastfeeding? Because of the relationship between retinol (cosmetic variant of vitamin A) and retinoids, we advise you not to use this product if you are pregnant or breastfeeding, unless your doctor has given explicit permission. Although there is no direct evidence that cosmetic retinol can be harmful, we’d prefer to err on the side of caution. What causes ageing of the skin and can anything be done about it?